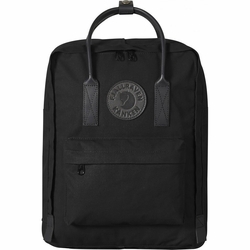 Fjallraven Kanken No.2 Black Backpack. Completely black version of Kanken No. 2 in G-1000 HeavyDuty with leather details. Practical for everyday use with a spacious main compartment, front pocket and seat pad. Kanken No. 2 Black pretty much speaks for itself: Black on black, but with a colourful personality. A monochrome friend of Kanken No 2, also made from durable, waxed G-1000 HeavyDuty with leather details. An everyday backpack with excellent longevity that is just as practical to use for school or work as it is on an outing or when travelling. The main compartment has a generous opening that makes it easy to pack and unpack. An inside back pocket has a padded seat pad made from G-1000 HeavyDuty, easy to take out when you want to sit down for a pause and when in place, it keeps the backpack’s contents from pressing against the back. Two open pockets on the sides and a zippered pocket on the front. Business card holder inside. Leather details and handles, textile shoulder straps.